But while three or four weeks ago I was dreaming of my old Boston bathtub, now I think my Shower and I have come to a nice peaceful equilibrium. And Taipei certainly has better showers than many other international locales. In loosely chronological order, I give you Kim’s International Shower Review: a review of all of my showering experiences abroad. Feel free to chime in below with your favorite watery destinations! First, the criteria. Stars are out of 5 stars, judged on the basis of: water temperature, pressure, quality of stall/curtain/bathtub, potential duration of shower length, relaxation potential, and overall experience. These are all from memory, and do not necessarily reflect national showering standards, so please don’t take these as unchanging judgments– it’s more of a rumination on various adventures abroad, and what makes this shower-er happy! Costa Rica, circa 1996: **** 4/5 stars. The weather when traveling with my mother and cousin was divine, so I didn’t really notice anything other than the fruity-smelling Costa Rican shampoos. 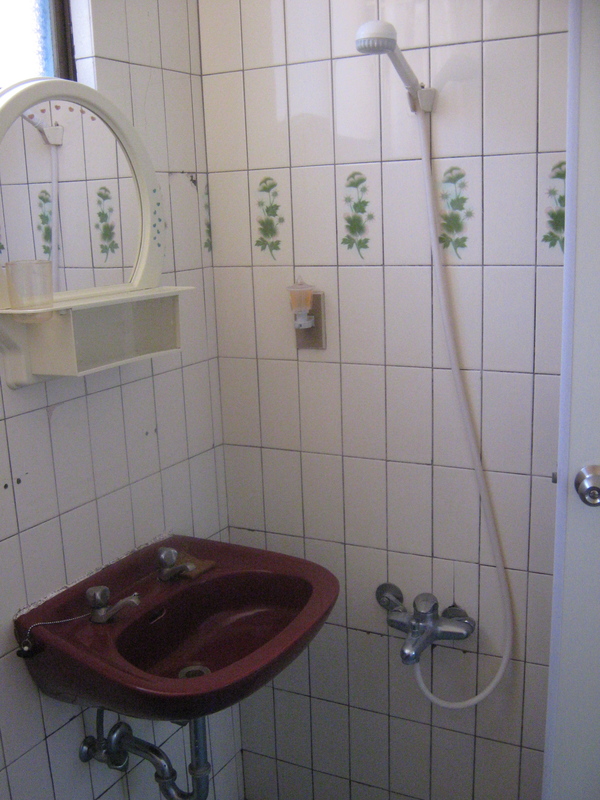 But the shower stalls were always very nice and very clean, and if the hot water wasn’t endless, it didn’t have to be. France, 2001: **** 4.5/5 stars. Because this was a high school trip, we stayed in more touristy, commercial style hotels that had traditional western/American style showers with a bathtub, shower curtain, and elevated shower head, even it was detachable. We did make a big stink however, about the bidets in one of the hotels– which wound up being quite useful for washing off my flip flops when I accidentally stepped in a treat that a dog had left in the street. France again, 2005: ** 2.5 stars/5. Now, Chez une famille d’accueil (host family), another Stanford student and I shared a bathroom and a small kitchen– almost a small, separate apartment within their larger one! However, the plumbing situation was a bit of a shock. There was an enormous tub up on a platform, a detachable shower head without a real place to hang it and take a standing up shower, and No Curtain. Aka, in sleeting early April without central heating: CHILLY. Also, the toilet had a pull-cord for flushing it, and sometimes our hair dryers kicked the circuit breaker. It was lovely, quaint, and so very old-school Paris– I wouldn’t have traded that apartment for anything, but it was an adjustment experience! Brussels, 2005: **** 4/5 stars. We actually stayed in a decent hotel in Belgium for an outdoor jazz festival, and my friend smooth-talked the hotel administration into giving us an extra cot for a 3rd person without charging us– so the room’s amenities reflected our accidental luxury. England, 2005: **** 4.5/5 stars. After almost four months living in Paris, I was surprised to find that everything in England was backwards. While the French drink wine, Brits drink beer, drive on the other side of the road, toss back tea instead of coffee, milk chocolate instead of dark…. and have LOVELY showers. This might have been my best showering abroad experience of the lot: the water was hot, the tubs were always bigger than they needed to be, and it was like the best of America away from home. Yes, this is a picture of my adorable bathroom. Underneath the sink is a drain in the floor. Behind the photographer, a curtain draws the bathroom in half, doing absolutely nothing. But it's mine, all mine, and the water is hot!! Taipei, circa now: *** 3.5/5 stars. After Colombia, I began to appreciate that America’s greatest exports are its TV shows and its plumbing. So my expectations have since lowered a bit, and I braced myself for the worst when I arrived in Asia. But for most factors, Taipei does well in the showering front! The water is hot, the pressure is good, it’s possible to settle into a nice comfy shower… except that my apartment has no curtains, stalls, or anything. So my bathroom IS the shower area, and the floor gets soaked every time. 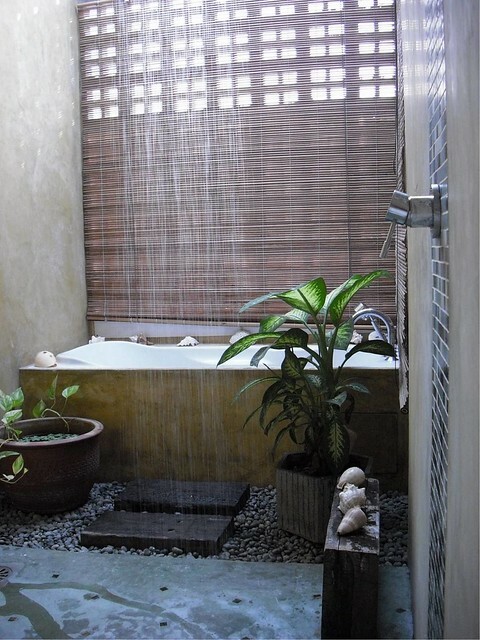 (It should be noted here that some of my friends have awesome-looking shower/tub setups, so this is sort of like having a bathtub vs. not in the US.) At first this irked me, but now I see it as a chance to clean and wipe up!…well, most of the time. Sometimes it still bugs me. And if several people are showering–like when I have friends visit– we just brace ourselves for a little time under the proverbial sea. But as the weather gets cooler, I get more and more happy with a sauna-like room of hot water and steam. 不錯, Taiwan showers– bu cuo indeed. Great to read your posts and see your photos. Send me an email, okay?